Article copied from Ventana View: “Many of the year round residents and part time residents have noticed an increase of traffic on the road from the Police station north to the hot springs. The new traffic seems to be related to the new down winder groups these last 2 years. There are truck/car/squad loads of groups who blatantly speed. The locals in this area, whether Mexican or Foreign are questioning the safety. Some are afraid to drive, walk, walk their dogs, run and mountain bike the main road. For common courteously the community is asking those folks to please slow down. It is OK to be courteous to others. There have been several near accidents driving and the increase in dust is also not welcome. This is Baja relax and enjoy! Concerned residents of El Sargento” I might add that unless we all slow down we will see dirt tope speed bumps like there used be on this road. And that will be a drag for all of us. There are 3 basic winter time wind patterns in Sea of Cortez shore line of Baja Sur. There are frequent local sea breezes or thermal winds in the 8-15 knot range at locations like Los Barriles and especially La Ventana where a large valley downwind heats up in the afternoon. As parcels of hot air expand and rise in the afternoon they create a low pressure area. As this low pressure increases the wind a few miles offshore begins to ramp up and head towards shore. Often in this pattern the Sea of Cortez will be glassy calm in the AM with perfect fishing, SUPing kayaking conditions. Then mid day you will see see a wind line in the distance. Shortly there after very steady but mild winds reach the shore. As you head further away from shore the wind will gradually weaken. Expect no swell and just small chop in this pattern. At sites like LA bay that lack a large valley down wind local sea breezes are uncommon. These winds are strongest in the La Ventana to El Sargento area. On the weakest local sea breezes days the strongest winds will be north of El Sargento in the 1/4 mile stretch from the Hot Springs southward. Only big kites are likely to be powered on these days. The image at the very bottom of this page shows what a local sea breezes looks like as it moves towards shore. Note the calm water in advance of the local sea breezes front. Los Barriles has much weaker local sea breezes so in this pattern head to the La Ventana area if you are desperate for wind. 2. Strong El Norte wind pattern: Most years these gusty winds in the 20-30 knot range occur every several weeks. 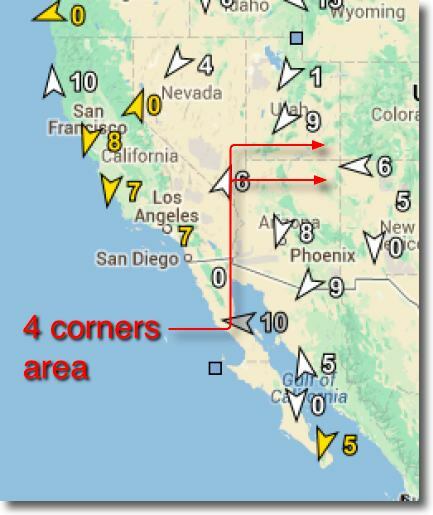 These winds occur after a storm passes over California and high pressure that follows the storm settles for a day or two in the 4 corners (where all the square states meet). This creates a strong pressure gradient from the 4 corners to low pressure south of Baja. This high pressure is strongest at night when the frigid airs of the 4 corners strengthen the high pressure. So typically you will first notice huge blasts of wind in the middle of the night that announce the arrival of El Norte. These winds roar down the middle of the Sea of Cortez so you will notice huge lumps on the eastern horizon at dawn. The key to getting these winds to move to the shore is inland heating. If the sky to the west is mostly clear then expect the wind to ramp up between 8 and 11AM. If there are clouds are if there is any hint of NW wind from the pacific then these winds may barely reach the beaches except at Los Barriles. A lot of the force of El Norte is from winds just aloft that make the surface wind UP AND DOWN. Sometimes the wind just aloft is NNW which tends to blow the El Norte surface wind away from shore. This often means on and off wind at the beaches. Typically Los Barriles has the strongest El Norte winds because it stick further out into the Sea of Cortez than La Ventana. The further outside you sail the stronger the wind and the bigger the huge swell. 3. Local sea breeze pattern + Weak El Norte wind: This is the most common wind on Baja’s East Cape with winds in the 18-24 knot range. This occurs when there is a weak low pressure in the 4 corners which creates wind that slides down the Sea of Cortez as 5-10 knot winds. Once it arrives it combines with the 10-15 knot local sea breezes. This brings you wind in the 15 to 25 knot range with small swell. Remember Baja’s East Cape wind blows in cycles as high pressure areas move across the USA. So you have several days of good wind and then several days of modest to no wind. And every season there are periods of a week or more without wind. So sailors and kiters in the know stuff every possible toy into their caravan that space and budget allow. The most useful toys are mountain bikes, surfboards, dirt bikes, ATVs and kayaks. Taxi Service : SAMUEL turissaven@hotmail.com, or cell, 612 167 1550. Adelita’s Tower Restaurant. Try our made-to-order fresh food! Super Burros, Chili Rellenos, Chilaquiles, Tacos, Cubanas, Ceviche, Huevos Rancheros. Breakfast, lunch, dinner. Just South of the Telmex tower in ES.call ahead & your food will be waiting, or you can also call for take out/Come see us & bring your own beer if you like. 114-0035. Bandidos Bar Everyday Angus, chicken or veggie burgers. Angus arrachera tacos & Quesadillas! Coming soon morning tacos!! Fish, shrimp & arrachera bandidos style! Closed Wed. *ATM *Out of cash?? Los Bandidos Bar has the only ATM in LV/ES. Restaurant “La Playita” Come enjoy authentic Mexican food, breakfasts, main dishes & drinks in a spectacular beach front setting! Located at Dalaney’s Beach Resort, just south of Baja Joes. Open Tuesdays to Sundays 9 AM to 6 PM. Rincon de la Bahia Announcing New promotion January and February, starting atención 5 pm. A different dish each day at special price . February 14, different dinner. Closed on mondays. Restrictions apply. Tacos & Bar Los Potrillos in El Sargento,open every day from 7.30 am – 11 pm, serving breakfast, lunch, dinner. Papas rellenas, tacos, burritos, chiles rellenos of shrimp, fish or carne asada & more. Happy hour 5.30 pm- 6.30 pm, 2 drinks for 1. We are located on the east side of the main road, just north of Bandidos. Come and enjoy real Mexican food served by Noly Lucero. Or order foods to go at cel 612-183-19-26.